Bulldog fans are always proud to don the red and white but for one day in October Coahoma is going gold to bring awareness to childhood cancer. The Coahoma High School theater department will host a community assembly at 11 a.m. Wednesday in the high school auditorium to kick-off Gold Out. Coahoma ISD is joining a growing movement started by two mothers - Angel Miller and Kelly Pickel - to raise funds for children’s cancer research. Chris and Kristen Joslin personally know Jeff and Angel Miller along with their son Gunner, who was diagnosed with a aggressive form of bone cancer when he was a high school freshman. It’s why they are bringing the event to West Texas. Until joining Coahoma ISD this year, Chris Joslin worked for Jeff Miller, the head football coach and athletic director for Rockdale High School. Kristen Joslin described Gunner as a phenomenal athlete. In his freshman year, he was the up-and-coming quarterback for the Rockdale Tigers, played on the varsity baseball team, and was competitive in track and field events. Then during track season, Gunner began to feel severe pain in his schin. After tests and a visit to the doctor, the all-around athlete was diagnosed with Ewing sarcoma, an aggressive form of bone cancer. The news meant an end to this high school football playing days but not an end to his football career. Instead of leading his team on the field, Gunner served as student coach for the Tiger’s special teams. He was on the sidelines when the Rockdale Tigers won the 2017 3-A State Football Championship. In fact, it was Gunner who snapped the final play of the game at his teammates request. To honor Gunner and all youth who are fighting to survive cancer, Coahoma ISD will be raising money for the next two weeks to donate to children’s cancer research facilities. 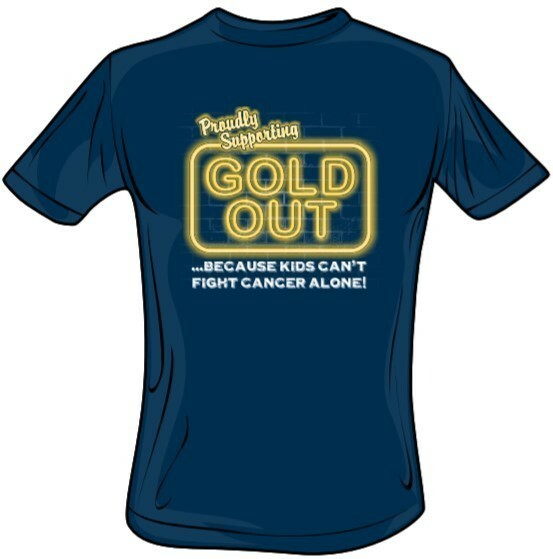 Gold Out shirts will be sold for $10 a piece of which $3 will go towards the cost of the shirt and $7 will be donated directly to a children’s cancer research facility. This year’s shirt is black with neon gold lettering. Bulldog fans are encouraged to wear the Gold Out T-shirts for the Coahoma/Stanton varsity football game set for Oct. 26, in Stanton.